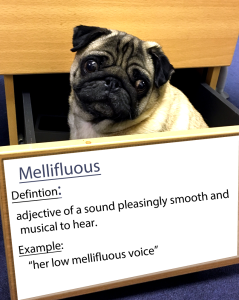 Mellifluous, Word of the Day! Definition: Adjective of a sound, pleasingly smooth and musical to hear. Word of the day, Exasperated! Word of the day, Tantalise! Scintillate, word of the day! Word of the day, Sulk! Word of the day, Drench! Word of the day, Initial! Word of the day, Analysis! Word of the day, Invigilate!